Physics cannot describe what happens inside a black hole. There, current theories break down, and general relativity collides with quantum mechanics, creating what's called a singularity, or a point at which the equations spit out infinities. But some advanced physics theories are trying to bridge the gap between general relativity and quantum mechanics, to understand what's truly going on inside the densest objects in the universe. 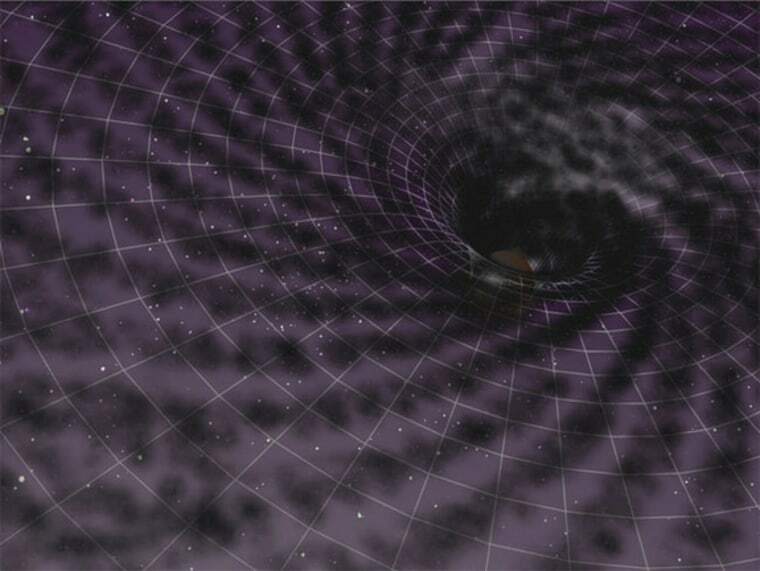 Recently, scientists applied a theory called loop quantum gravity to the case of black holes, and found that inside these objects, space and time may be extremely curved, but that gravity there is not infinite, as general relativity predicts. This was the first time scientists have applied the full loop quantum gravity theory to black holes, and the results were encouraging, researchers said. A black hole is created when a huge star runs out of fuel for nuclear fusion and collapses under its own gravity. The star's outer layers are expelled, and its core falls in on itself, with the pull of gravity becoming ever stronger, until what's left is the core's mass condensed into an extremely small area. According to general relativity, this area is a single point of space-time, and the density there is infinitely large — a singularity. But most scientists think singularities don't really exist, that they're just a sign that equations have broken down and fail to adequately describe reality. Loop quantum gravity appears to be an improvement on general relativity in describing black holes because it doesn't produce a singularity. The idea is based on the notion of "quantization," which breaks an entity up into discrete pieces. While quantum mechanics says atoms exist in quantized, discrete states, loop quantum gravity posits that space-time itself is made of quantized, discrete bits, in the form of tiny, one-dimensional loops. "The loop means the fundamental excitations of space-time themselves are one-dimensional in nature," said Jorge Pullin, a physicist at Louisiana State University, who co-authored the new study with Rodolfo Gambini of the University of the Republic in Montevideo, Uruguay. "The fundamental building block is a loop, or network of loops. For a visual image, think of a mesh fabric." This way of portraying space-time changes fundamental physics, especially in extreme settings such as black holes or the Big Bang — which is thought to have birthed the universe. The Big Bang, like black holes, is indescribable under general relativity, understood only as a singularity. "The subject really took off in 2005 when it was realized loop quantum gravity can naturally resolve the Big Bang singularity and that quantum space-time is much larger than what Einstein envisioned," Ashtekar told Space.com. Pullin and Gambini said their work is just a preliminary step, far from a full description of the true complexity of black holes. "This model we've done is extremely simple," Pullin said. Under their simplified model,"the black hole exists forever and doesn't evolve. As a consequence I cannot tell you exactly what nature is going to do inside a black hole. It could be that the singularity gets replaced by a region that gets highly curved, but not infinitely curved. Or it could be that it just doesn't make sense — you get a region which doesn't behave like classical space-time. It would interact with particles in different ways than we normally think." Now that they've achieved this step, the researchers hope to advance their work by making the black holes in their model more dynamic and changeable. "The black holes we studied were in empty space — there was no matter in them. They were pure space-time," Pullin said. "We're trying to add matter, because then it adds dynamics. We're in the middle of that now." The study was published May 23 in the journal Physical Review Letters. Black Hole Quiz: How Well Do You Know Nature's Weirdest Creations?